Killington, VT – A day after finishing fourth in giant slalom, Mikaela Shiffrin skied away with her 45th World Cup victory on Sunday in front of more than 15,000 screaming fans who braved mist, rain, and fog to cheer not only the best ski racer in the world to victory, but for the first time in years, three Americans who qualified for the second run. 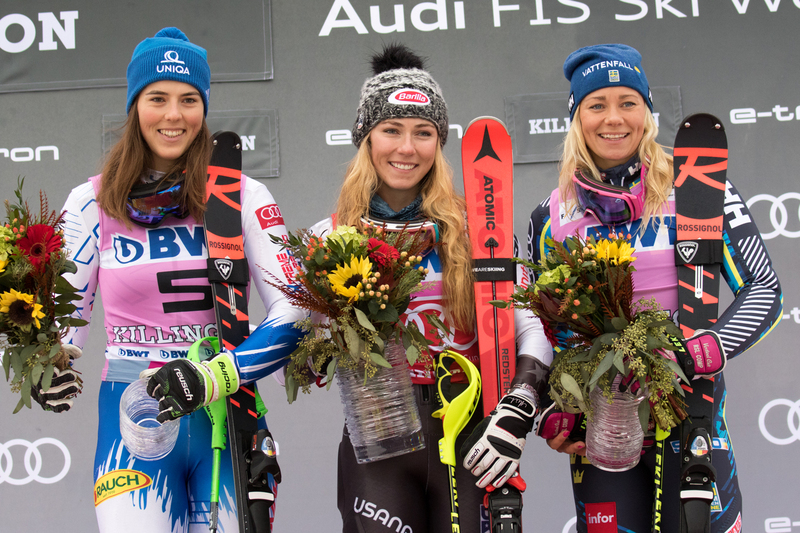 “It’s been a while since we’ve had a really strong showing and Nina…I watched her first run today and I was like ‘that’s the kind of fight I’m going to have to have in the second run.’ It was so awesome,” Shiffrin said. “We’ve been training together and I’ve seen these flashes of absolutely brilliant skiing and I saw some of that today. An even bigger crowd estimated at 18,500 showed up to watch Saturday’s giant slalom. Shiffrin ended up just off the podium in fourth place as Italy’s Federica Brignone wowed the crowd with her solid skiing for the victory, followed by Norway’s Ragnhild Mowinckel and Austria’s Stephanie Brunner in third. The ladies came in charging on a first run course that was relatively open and straight and laid down some impressively fast, aggressive skiing. There’s no question Mowinckel’s giant slalom skills are impressive, but her super G skills came into play that first run too, as she took a more direct line than most of her competitors and secured a big 0.37 second lead over Brignone. However, with “hero snow” on Saturday, only a few tenths separated positions two through eight. Shiffrin sat in sixth, 0.69 seconds out after the first run, but within striking position for a podium. Tom “Cowboy” Johnston, who is in charge of the surface, ensured his team put together a bulletproof track, and unlike Sunday’s slalom the snow was perfect on Saturday – perhaps, even a little too perfect (if that’s even a thing) in some athletes’ minds. Accustomed to slick, hockey rink-like surfaces on the World Cup, athletes found that Saturday’s surface held up so well for the entire field…which is the best “problem” to have. However, that made it harder for athletes to make big gains and separate themselves from the field. Hence, the tight time differential. “The first run I had some really good skiing, but some of the turns I was just not aggressive enough. The second run I was much more aggressive, but it wasn’t quite enough. 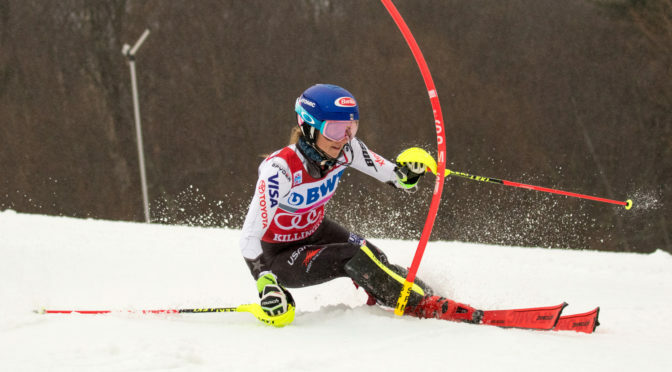 Watching Fede (Brignone) go down I was like, ‘Well, yeah – that makes sense!” Shiffrin laughed. 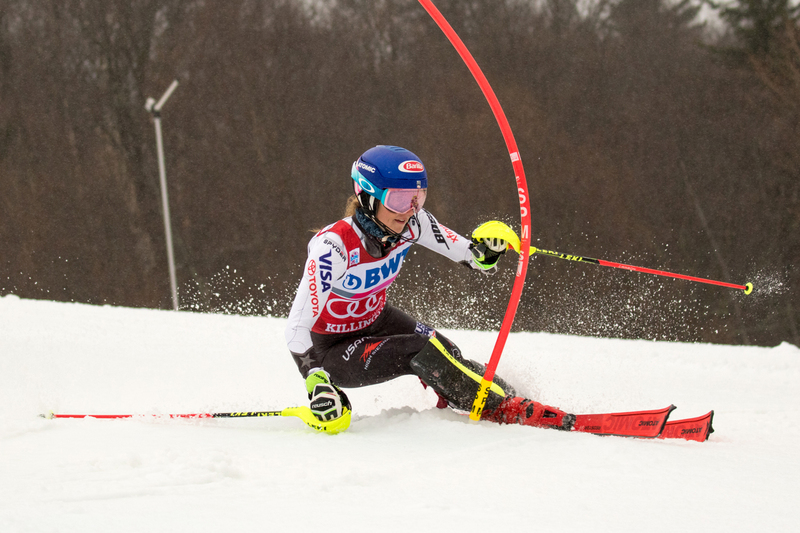 Shiffrin upped the intensity for the second run. She skied clean and strong, with great tactical precision, and came through the finish in the lead by .32 seconds, but Brunner, Mowinckel and – particularly – Brignone were just extremely sound and solid. They turned up the intensity just a notch higher, and it paid off for them. Last year’s Killington giant slalom winner, German Viki Rebensburg, ran into some trouble and skied out, while 2016 Killington giant slalom winner, France’s Tessa Worley finished in fifth, just two hundredths behind Shiffrin. Up next, the women’s World Cup moves on to Lake Louise for a pair of downhills and a super G. Shiffrin scored her first career World Cup downhill win at Lake Louise last season and plans to compete in all three events next week.